Follow the instructions below, in sequence, in order to set up the basic framework of how Empty Desk works. Set up correctly, you are left with the “paper”, but without the “work”. This represents one full year of your records. In the illustration below, you will see that there are monthly Statements and that illustrated is the October 2013 Statement filed between the October and November Dividers. It does not matter if the Statements do not entirely match the monthly sections, as long as the Statements are in chronological order. 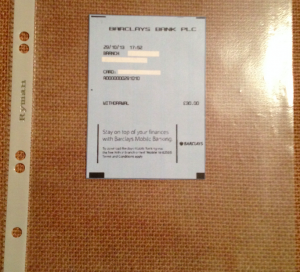 For documents of A5 size, or smaller, this is usually best done by placing the documents in an A5 punched pocket. Larger documents can be hole punched. 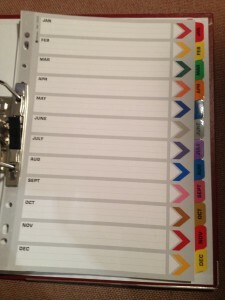 A5 punched pockets are available at leading stationery shops or online. 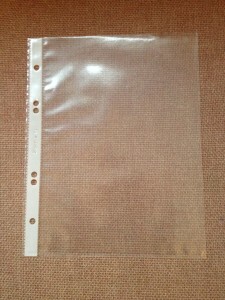 Do not use A4 punched pockets for the A5 and smaller documents. They are too clumsy and also overlap the divider tabs, which makes selection cumbersome. Below is shown an ATM withdrawal chit/debit note firstly inside it’s A5 pocket and secondly in it’s appropriate place in front of the relevant Bank Statement. 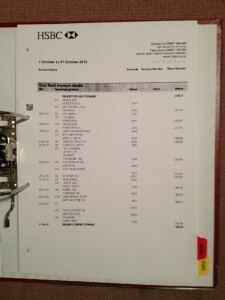 Once in the A5 pocket, the document can be put in front of the Bank Statement that shows the relevant transaction. In this case, a withdrawal of cash on 29th October @ 17:52 hours. All other documents relating to entries on this October 2013 Bank Statement are either filed above or below the withdrawal chit, depending on where the relative entry appears on the Bank Statement. 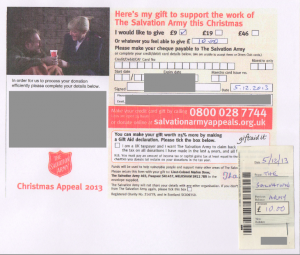 The picture below shows an A4 document being put into it’s relevant space. 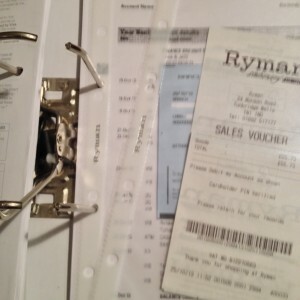 A hole punch is used, for this document, so as not to have to use an A4 punched pocket. 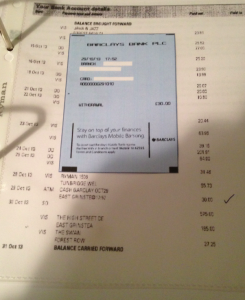 This A4 document goes on top of the previous smaller documents as it’s position on the Bank Statement is before the entries for the other two documents. 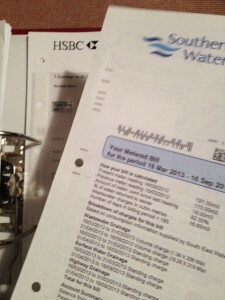 Documents for which a Bank Statement has not yet been received are kept in the current month, in date order. This makes it easy to calculate exact balances, as it includes items not yet reconciled against the Bank Statement. Details of Standing Orders and Direct Debits and the like can be noted on the back of each Month Divider, for easy reference. Make sure to include Credit Card Statements and the A4 size Notices from your Bank as to the Bank Charges due in the following month. Keep Credit Card Statements in a separate Lever Arch Folder, with the documents relating to each Statement entry being filed in the same way as described above. 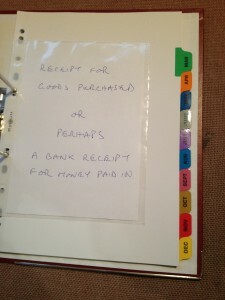 The original Statement is filed in the Credit Card Folder, a copy of the Credit Card Statement being put in the Current Account Folder, in sequence, in front of the relevant entry. This not only makes writing cheques easier, particularly the stubs, but it also enables you to staple each Cheque Stub to it’s corresponding Invoice. The Cheque Stub is with it’s Invoice, which in turn is in front of the relevant Bank Statement – no need to hunt for the Cheque Book and Invoice/ Receipt in order to reconcile with the Bank Statement. Of course, the Cheque Stub could be put in an A5 punched pocket, or smaller pocket / wallet, and placed in front of the Invoice. 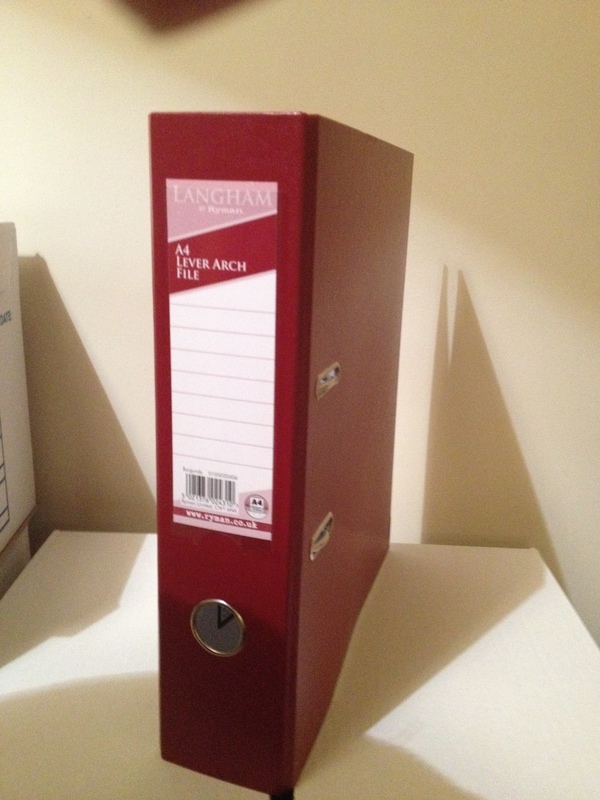 All relevant paperwork is now in one place, appropriately linked to corresponding papers. You see, paperwork cannot communicate over a distance without your help. So if you remove the distance involved, by linking all of the documents together in one place, then you do not have to act as the link for each document. This releases you from attachment to the papers and enables you to be in control of those papers, rather than part of that attachment. Basically, you cannot control something that you are a part of. You will know when you have completed the exercise correctly, as you will feel free from your paperwork. Those who have completed the exercise already have made comments like, exclaimed even, “Where has it all gone?” and “It’s all in there” – pointing to the Lever Arch File. Having established the principle of how your paperwork is linked, you will next expand the activity to how it will work, in practice, in the office, linked, but without having to keep all of the documents in one place. This is not illustrated on this website as the initial action has to be completed first. You will never lose the realization yourself, even if you no longer wish to maintain the all in one system illustrated. How to expand the established link, to fit into required sub sections, will now be easier and more effective. Remember that the “Empty Desk” system is not about perfectionistic saving of every piece of paper that you receive/ have. Empty Desk is about having NO CLUTTER and having in one place, correctly linked as one, that paperwork which isn’t clutter. The fact that you might have a few items missing is no problem in achieving The “Empty Desk”. Having too many items is a problem for The “Empty Desk”.